When it comes to decorating your home for Fall, Halloween and Thanksgiving; look no further than Jim Jenkins Lawn & Garden Center for new ideas and great quality items. As summer comes to an end and the weather cools down, it is time to think about making some changes to lift your mood. Welcome visitors with a front porch that radiates an inviting, warm feeling, one that friends and family will want to come back to throughout the season. Many of the decorations you display now can be kept out through Thanksgiving, just add a few Halloween items the last few weeks of October and remove on November 1st ! Start with the basics; Hardy mums, cornstalks, straw bale, scarecrow , pumpkins and gourds. Add a personal touch with colorful ribbons, bows and flags. Don't forget the popular inflatables in many styles. Fall wreaths on your doors are a must ! We have a great assortment of sizes, colors and themes. We even have a custom wreath making department so that you can create your very own design. Take a look at our FACEBOOK page for great ideas and pictures. There are endless options when it comes to decorating your home for the seasons and holidays. Many of them are easy and inexpensive. So get your decorating creative juices flowing and come into visit our Décor/Gift shop today…be sure to print out the coupon from this site ! We are proud of our selection of outdoor decorating items, many unique things you will not see anywhere else to make your home a stand out in the neighborhood. You always knew we had your outdoor decorating needs covered, but did you know that we have a huge selection of indoor decorations also ? We are full of ideas and items to keep your home up to date seasonally. Our store changes inside and outside for every season, with decorating idea displays changing on at least a weekly basis. We are now ready for Fall, Halloween and Thanksgiving…are you ? We have an outstanding selection of all types of lighting options, garlands, statuary, table décor and more. Have you seen the latest fashions in Pumpkinwear ? How about decorative pumpkins stands ? Come in to explore and experience the season changes…you will be glad you did ! You will find the perfect gift for that someone special ! We have a great Steeler/Penguin section for Dads', as well as many unique gift items for everyone else; and don't forget to treat yourself ! Gift Certificates are always available year round for that someone who has everything! Planting too late and not allowing the plant to establish itself in the ground. Not mulching the plant to protect against temperature extremes. Keep mums in their pots. Once they have been frosted and turn all brown, cut them back to within one inch of the soil. Be sure the soil is moist, if not, water. Next, place the pot in a protected area, whether it is in an unheated shed, garage, cold frame, against a building or under the protective branches of an evergreen tree. The idea is to protect the plant from getting as cold as the regular outside temperature. If placing the plant outdoors, cover it with 6-10 inches of mulch or 12- 18 inches of leaves. If keeping the plant in an unheated building, place it on top of some newspapers or magazines to help insulate the roots, then surround the plant with more papers just to protect them from any drafts and keep them a little warmer. If keeping the plant inside, check it once a month to see if it needs to be watered. If dry, water. When the weather turns mild in March, bring the pots outside and place them where they will be watered and fertilized throughout the summer, or plant them in the ground. See our fact sheet on how to grow and care for fall mums. A very popular plant for late season color is fall mums, also called "Garden mums" or "Hardy mums". Fall mums were once known as Chrysanthemums, but taxonomists have recently changed their botanical name to Dendranthema x grandiflora. Fall mums are available in a wide selection of colors, flower types, shapes and sizes. They are a low maintenance, easy to grow plant that can be kept in containers or grown in beds. They are drought resistant and generally free of insect and disease pests. Most fall mums are purchased and planted from late August into September. They prefer to be planted in an area that receives full sun, but most cultivars can get by with a half day of direct sunshine. For ultimate growth, plant your new fall mums in fertile well- drained soil. Poorly drained soil is the leading cause of winter mortality. Young plants in small containers should be planted 18-24 inches apart. Mature plants can be planted at any desired spacing providing they are planted no closer than just touching their neighbor. Fall mums in containers need to be planted in the ground BEFORE the first hard frost ! Newly planted fall mums will not require any fertilizer this season. During the next growing season begin feeding your mums as new growth emerges with Schultz fertilizer. Feed your plants at least monthly until August. After several hard frosts have blackened the plants, cut them back to within one inch of the soil. Mulch to a depth of 3-4 inches. The purpose of mulching is to keep the soil frozen. Once your fall mums start re-growing, remove the old stems. Start feeding every month until August., To encourage branching and compact bushy growth it is important to pinch the plants in the early spring. Once the plant has reached 4- 6 inches, remove 1-2 inches of the new growth on every shoot. After the plants have grown 3-5 inches from the first pinching, it is time to pinch again (1-2 inches). Stop pinching your plants around mid-July. This may seem like a drastic measure, but come fall you will be rewarded with compact bushy plants that are robust with flowers. Your mums can be divided every two years in early spring. Plant these beauties now and watch them grow and change colors as the temperatures become cooler. These hardy plants will become bright purple, white and green and will shine through even when the snow starts to fly ! Pair them up with Fall Mums, pumpkins, cornstalks and scarecrows for the ultimate Fall display! FALL IS A GREAT TIME TO DECORATE YOUR HOME. THERE ARE ENDLESS POSSIBILITIES WITH AL OF THE GREAT CHOICES YOU WILL FIND HERE AT JIM JENKINS LAWN & GARDEN CENTER ! The season has changed here at Jim Jenkins Lawn & Garden Center. We have just received all new stock of shade and ornamental trees and are offering deep Fall discounts so that you can fill your landscape with unique, top quality plants now for a beautiful Spring show! We have gorgeous trees with Fall color and blooms, such as Crimson King Maples, Red Sunset Maples, Eastern Redbuds, Forest Pansy Redbuds, Dogwoods, Cherries, Pears and the hard to find specimens such as Sourwood, Gingko Biloba, Katsuratree, Autumn Flowering Cherry and Espaliers. Now is the time to visit us and experience our all new Fall displays with a great selection of trees, shrubs and perennials. We offer delivery and planting along with many other services to insure your planting success ! We have everything you need to decorate your home (inside and outside) this season. All sizes and colors of hardy fall mums are just the beginning of your Fall displays. We stock straw bales in three different sizes, scarecrows galore, large cornstalks, Indian Corn, bows, flags, Thanksgiving items and so much more! Check out the Fall Décor/Gift Shop page for great ideas on decorating your home. Also visit us on FaceBook for daily pictures and ideas. We are extremely proud of our HUGE selection of Pumpkins , Gourds and Squashes! We have many specialty varieties such as whites, blues, greens, reds, warties and Peanut Pumpkins so that you can create unusual displays and be the envy of the neighborhood. We have many unique and unusual Seasonal decorations and gifts. We also show our "Pittsburgh Pride" with a great Steeler and Penguin Black & Gold décor section. Halloween is always so much fun here at Jim Jenkins Lawn & Garden Center ! Our HAUNTED ROOM is always a favorite for the young and old alike. Be ready to be entertained by all of our life-size monsters and ghouls and stroll through the Graveyard for scary surprises ! Halloween decorating has become as popular as Christmas decorating and we have everything you need to decorate your home, both inside and outdoors for Fall, Halloween, Thanksgiving and Christmas. We would love to meet you and here your ideas on decorating and what your Holiday traditions include. Please always remember that Jim Jenkins Lawn & Garden Center is passionate about plants and people. Our goal is to educate you and provide you with high quality plants and decorating items to transition your home from season to season. We are open year round to help you enjoy ALL seasons! Jim Jenkins Lawn & Garden Center is THE PLACE "Where Every Lawn & Garden Should Begin" AND "Where Every Season Should Begin"
FALL IS FOR PLANTING ! Fall is the best time to plant trees, shrubs and perennials. The cooler temperatures mean less watering and less stress on the plants. The plants will have plenty of time to grow a great root system before the ground freezes which means a stronger, healthier plant next year. You can continue planting through mid-October. Here at Jim Jenkins Lawn & Garden Center we restock fresh, new stock even now so that you have the same great choices as in Spring. Fall is also the best time to take advantage of GREAT Sales and Discounts, so plan next years' landscape now and SAVE ! WHY PLANT TREES AND SHRUBS AT ALL ? Environmental Benefits of Fall Planting Plant trees and shrubs first-they are the most valuable plants in the landscape because they are the most useful. They are energy savers, air-conditioners and wildlife havens. Shade trees can reduce your heating/cooling costs by 10-50% ! In one year an average tree produces enough oxygen for a family of four for one year. The net cooling effect of a young, healthy tree is equivalent to 10 room-size air conditioners operating 20 hours per day. One acre of trees and shrubs has the ability to remove 13 tons of particles and gases annually. The amount of fossil fuels used for heating/cooling is reduced by using trees and shrubs to modify temperatures. Planting trees and shrubs remains the cheapest and most effective means of drawing excess carbon dioxide from the atmosphere. One tree can remove 26 pounds of carbon dioxide from the atmosphere annually, equaling 11,000 miles of car emissions. Tests done in a mall parking lot showed a 31 degree difference between shaded and un-shaded areas. 2.6 tons of carbon is sequestered in a year by one acre of trees and shrubs. Street-level particulate pollution can be reduced by 60% by trees and shrubs lining an urban street. One 12" caliper Sugar Maple can remove 5200 mg. of lead from the air in one year. Trees and shrubs intercept water, store some of it, and reduce storm runoff and the possibility of flooding. Air quality can be improved through the use of trees and shrubs and turf. Leaves filter the air we breathe by removing dust and other particulates. Leaves absorb carbon dioxide and other air pollutants (such as ozone, carbon monoxide and sulfur dioxide) and give off oxygen. By planting trees and shrubs, we return to a more natural, less artificial environment. The natural cycles of plant growth, reproduction and decomposition are again present, both above and below the ground. One of the best ways to increase your home's resale value is by adding trees and shrubs to your landscape. Adding trees and shrubs can increase your home's value by 10-15% ! September, October and November are the best months to plant trees and shrubs. Late season planting reduces stress on the plants and gives them a chance to establish a strong root system. Fall is more forgiving than dry summer months by offering cooler temperatures and less intense sunlight. Water requirements diminish during the Fall months. So add value and beauty to your home AND help improve the environment, PLANT TREES AND SHRUBS. 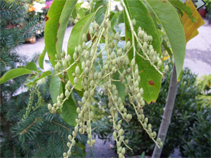 Sourwood Tree: Small ornamental tree with clusters of drooping, fragrant white flowers which cover the entire tree all summer like a white lacy veil. Fall brings on multi-hued colors. 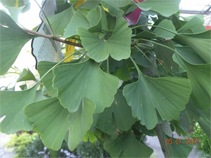 Ginkgo Biloba Tree: Unusual fan-shaped leaves, the only two-lobe leafed tree in America! Turns an incredible clear yellow color in the fall. This male variety does not produce fruit. This trees' origin has been traced back to when dinosaurs ruled the Earth! Autumn Flowering Cherry: Deep pink buds open to light pink flowers in early spring, then these soft pink flowers return in the fall for an encore! Katsura Tree: The name may sound like a sneeze but this tree is nothing to sneeze at! 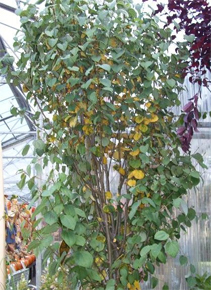 Blue-green foliage that turns iridescent shades of apricot-orange in the Fall. It also changes color from the inside out; most trees do the opposite. These unique trees are just a few of the trees we have looking for good homes where they can provide years of shade and enjoyment. Don't forget: we deliver and plant trees for you so you can just sit back and enjoy! 1877 Painters Run Road Upper St.